but anything connected through wifi clocks no more than about 15-20 mbps. Any advice? This is something relatively new. I noticed the slower speeds in the last 2-3 weeks. WTF? There are many reasons you could be having issues with your Airport. With any of the above situations, you will want to tweak your router's channels to make sure you get optimum reception. Of course, distance matters a lot - the closer you are to it, the clearer your signal will be, and the faster it will therefore be. Your devices also should be supporting the same advanced wireless protocols - the newer they all are, the better your range & speed will be. Also, you will want to make sure you are positioning the router properly. It should not be against a wall or near metal, or any other wireless devices. It goes without saying that you shouldn't have anything on top of or below the router, as that can also significantly interfere with the signals being sent out. My Apple Airport started giving me slower than expected speeds and eventually started giving me an "over heating" error all the time. I later replaced it with one of the Google OnHub routers which is ultimately a much better device. Yeah. Wouldn't surprise me if three years of "always on" would eventually cause some issues for any consumer-grade device. You like the OnHub, Matt? Care to share any specifics that led to this conclusion? I dunno, I've got a Linksys 54-"G" era wireless router that has been always-on for a decade or so. Still truckin' when I retired it few months ago (It got trumped by the Lady's N-speed router). Some of these things just want to sit there and cook. 15-20 should still be plenty fast for most purposes. What's your ping on WiFi? I had experienced poor performance albeit with decent clock speed that I chalked up to too much latency, probably due to the large printer sitting between my laptop and the router four feet away. Yeah a few reasons. There are zillions of networks near me and I was concerned about interference. THe OnHub has technology to deal with that. A lot of the higher end modems look like a military drone, I have my router sitting out on the A/V cabinet so I wanted something with an aesthetic design. When I'm streaming content I can set either the Mac or AppleTV to be the priority device so my wife can refresh Instagram without jacking bandwidth away from what's on the TV. Recently they added control for devices like my Hue lights through a browser via On.here so I can access their control without installing an app on whatever device I'm using. But seriously, I have my router with custom firmware that will auto restart in the middle of the night to keep my connections fresh and let the device clear its temp data caches, it keeps everything running quick and smoothly. You could also potentially look into the card in your device. Does your phone or any other devices have the same issue? Or just the computer? I've seen intermittent connectivity and speed reduction as symptoms of imminent failure of wifi cards in devices in the past. Also It's worth mentioning that your hardwire goes straight to the mobo in most cases or some kind of daughterboard, thus an easy way to troubleshoot the wifi card. 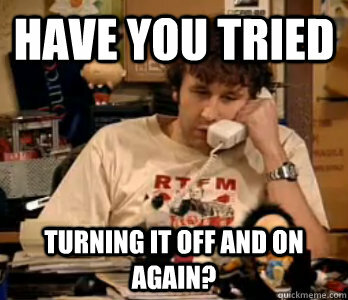 But if you're experiencing issues on all devices then I'd look to the router/modem like you have been.